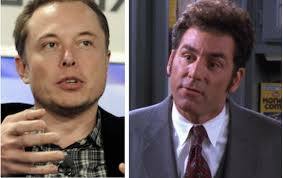 Is Elon Musk Rasputin or Cosmo Kramer? How many of us thought we would not live long enough to see the mind-blowing innovations displayed in countless sci-fi movies? How many of us thought we’d live to see portable communication devices that we could put in our pocket? How many of us considered self-driving cars and vision phones where we could see the person on the other end of the line? How many of us thought we’d have a computer in just about every home? How many of us thought with all these wild innovations that defied boundaries that we would all be wearing silver suits while watching TV, mowing the lawn, or doing the dishes in the distant year 2000? If you watched movies or TV during the bygone era, you knew these were the visions of life on Earth in the future. How many of us now laugh when we picture our deceased relatives trying to figure out how to use our current innovative gadgets? Our generation now knows that these sci-fi movies portrayed life in the 2000s correctly in some ways and incorrectly in others, but one thing they were right about is we know more technological innovation than our forebears did. Even the generation below us is more accustomed to life with such innovation than we were. Walk into any junior high in the country and you’ll witness work in robotics that is no longer speculative. You’ll also witness the work they do with computers that belies the fact that they are so accustomed to computers being a facet of human life that they’ve worked through any intimidation they might have had with the machines a decade before junior high. The question now is are we so accustomed to technological innovation that we’re more open to wild, crazy ideas than every generation before us, and are we so open to it that we leave ourselves susceptible to the possibilities of more from an ingenious charlatan? The early 1900’s were another period of great innovation. Individuals such as Nikola Tesla and Henry Ford were at the forefront of innovations that intimidated most of their populations. How many of them had a difficult time initially conceiving of the extent of man’s capabilities? How many people thought the advancements made in medicine alone bordered on the heretical? How many of them feared that “modern medicine” was coming close to messing with God’s plan when it came to prolonging life? As the people of that era attempted to come to grips with the advancements man was making in the fields of automation and medicine, the image of Michelangelo’s Creation of Adam must’ve danced in their head. Over time, the people of this era became more open to mankind’s ability to make life easier and better for their fellow man through advancement, but were they so open to these ideas that they became more susceptible to proclamations of a charlatan? Some say the time Grigori Yefimovich Rasputin spent on farms in small, obscure parts of Russia may have helped him understand the healing properties of some natural medicines better than most. Some say that he might have learned hypnosis techniques elsewhere in life, and he understood how to employ it before most understood it. Others suggest he may have learned autosuggestion techniques that some farmers used to calm their horses, and that Rasputin may have used one or all of these techniques to calm the nerves of the mother of the young heir to the Russian Empire. Whatever the case was, his ability to alieve the young heir of some of the symptoms of bad case of hemophilia was a cause célèbre in the nation of Russia. Some honored the great achievement, and others were in awe of the possibilities of what Rasputin could achieve. Some also fear him with that rationale. The largely ostracized Russians believed Rasputin displayed mystical powers, God-given powers. They thought he was a chosen one, and the Russian Empire gave him an influential role in the empire as a result. Some say that this precipitated the decline of the Russian Empire, but others say that implosion was inevitable. Is Elon Musk our nation’s modern day Rasputin? Rasputin cloaked his rise in mystical wonderment, and Musk drapes himself in the speculative questions of what a genius in the field of technological innovation can achieve. Both men also used their newfound status to make wildly ambitious claims to cause the citizens of their nation to hold them in speculative wonder. Columnist Norm Singleton paints a far less provocative portrait of Musk in his, “Elon Musk is the Cosmo Kramer of Crony Capitalism” column. In it, Mr. Singleton details the wildly ambitious ideas Elon Musk and his fictional counterpart relayed to their respective audience. The difference between the two, of course, is that Cosmo Kramer never received the federal grants the taxpayer has given Mr. Musk to pursue his wildly ambitious ideas. Another difference, and one Mr. Singleton does not explore, is that Mr. Musk has achieved some results that have established him as a certified genius. He founded X.com, which later became PayPal. He has an admirable record of accomplishment at SpaceX and Tesla, and he has a list of accomplishments that no one can deny. Singleton’s column does not focus on that list of accomplishment, but it does challenge the current resume of Elon Musk in a manner that no politician dare explore by asking if Musk’s current accomplishments align with the continued, all too generous federal and state grants he receives. Some might argue that Musk is not a charlatan, because of those accomplishments, and because he actually believes in all of his ideas, but Cosmo Kramer believed his ideas too, and so did Rasputin. Somewhere on the road to technological innovation, someone (likely a politician) convinced us that if our nation is fortunate enough to house a certifiable genius, we’re going to have to pay for the innovations he creates to make our lives easier and better. We’re not talking about paying for the final product of ingenuity at the proverbial cash register either, though there are some on the consumer end who don’t understand that concept. (They think the corporate responsibility suggests that all online innovation should be free.) We’re talking about taxpayers funding the creative process of the bona fide genius. For those who haven’t read as much as I have about the creative process, artists love to talk about it almost as much as they love creating. They love to talk about their influences, the structured method they used to bring their product to life, and the future projects they have in store for us. If someone were to pay these artists for such talk alone, I think most artists would give up the painstaking process of actual creation and opt for the life of describing their process instead. Filing for government grants has been around for as long as I’ve been alive, and as one who has never filed for a grant, I will admit ignorance on this topic, but I would think that success in field of receiving successive grants requires constant proof of success on the part of the artist. Enter the technological genius. Many consider Elon Musk the rare innovative genius who should not have to worry about pesky concerns like money. Politicians, specifically, appear to believe that Musk should not have to provide continued results for continued money, apparently, for demanding as much from a technological innovator that promises breakthroughs in science, would be tantamount to career suicide for them. Norm Singleton concludes his piece by saying that the best thing we could do for Elon Musk is to cut off all government funding for his ventures. Those who believe the concept that if we want technological innovation, we’re going to have to pay for the process, have never heard the quote, “The best we’ll ever see from an individual often occurs shortly after they’ve been backed into a corner.” Those who think the removal of financial support damages the creative process might want to go back and read that quote again. The politician who sticks their neck out to remove federal funding from Elon Musk would risk insulting Elon Musk, and Musk’s lobbying group might mortally wound that politician, but that insult might inspire Musk to prove the politician wrong, and that motivation might drive him to pursue greater profits as a result. Cutting him off from all state and federal funding might also force him to be a more traditional CEO, in that he would be more accountable to disgruntled shareholders, more cognizant of his companies’ profit margins, and it might force him to be more of a results-oriented man and less of a theoretical idea man. I think Mr. Singleton has a great idea, but in order for his idea to work, he would need to find a significant number of politicians who have the fortitude to say no to an established genius in the field of technological innovation. That politician would also have to fight Musk’s powerful lobbying groups and the stigma of the “against science” label. No, Elon Musk carved out an enviable place by being an established genius. He has also developed an enviable formula for all artistic geniuses to follow. Once a person has established themselves as a bona fide genius (no easy feat to be sure) all that genius has to do is develop some ideas for wildly ambitious projects on a semi-annual basis to achieve headlines in major newspapers that no politician can ignore. Their projects may never see the light of day, but they will secure nonstop funding from easily intimidated politicians. It may be a gross exaggeration to insinuate that the brilliant, innovative Elon Musk might be a charlatan, but when it comes to securing such regular, enormous chunk of the taxpayer’s hard-earned dollars, we the people, and our representatives, should hold the prospective recipient guilty until proven innocent. I may be alone in this regard now, as those in charge of allocating our tax dollars appear unafraid of defying logic, but I hold an achievement devoid government funding in higher regard. As former president, Calvin Coolidge said shortly before his demise, “I feel I no longer fit in with these times.” Perhaps I no longer fit in with these times, but if an entrepreneur states that his or her project made it to the marketplace based on individual ingenuity and sheer grit, I respect that accomplishment more. I also appreciate the effort it takes to pound the pavement and secure private funding, but the Elon Musk methods of convincing a bunch of politicians to part ways with other people’s money seems far too beneficial to all parties involved and way too easy.